There are certain couples that come into your life (or your church life) that understand what it means to live in grace, understanding, and love. John and Darleen Park are one of those couples. Here is part of their story. John Park, Jr. was a Pastor at Trinity Baptist Church for over 32 years. He served as the Recreation Pastor, then Married Adults Pastor, then Associate Pastor. 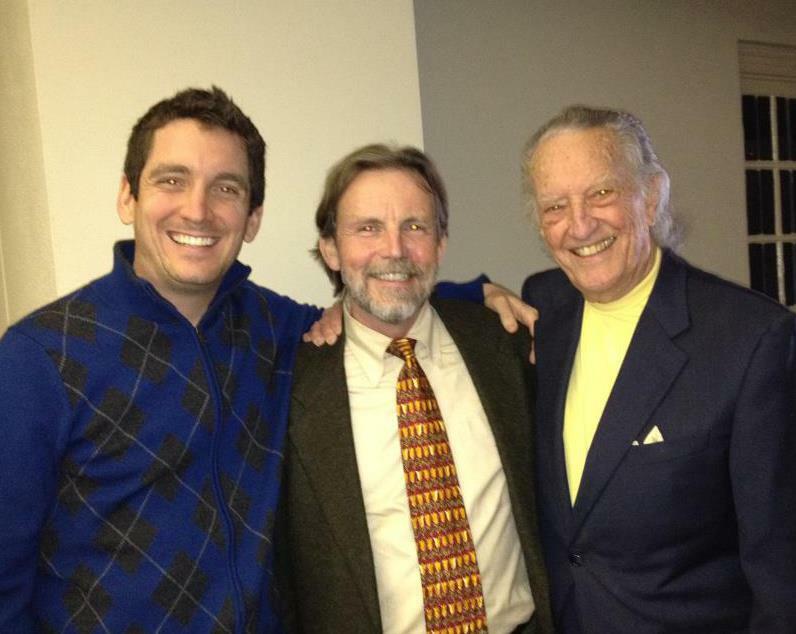 He was the only Pastoral Staff member who served with head pastor’s Buckner Fanning, Charlie Johnson, and Les Hollon. He was loved by everyone at TBC for his dedicated and consistent service to the Gospel. 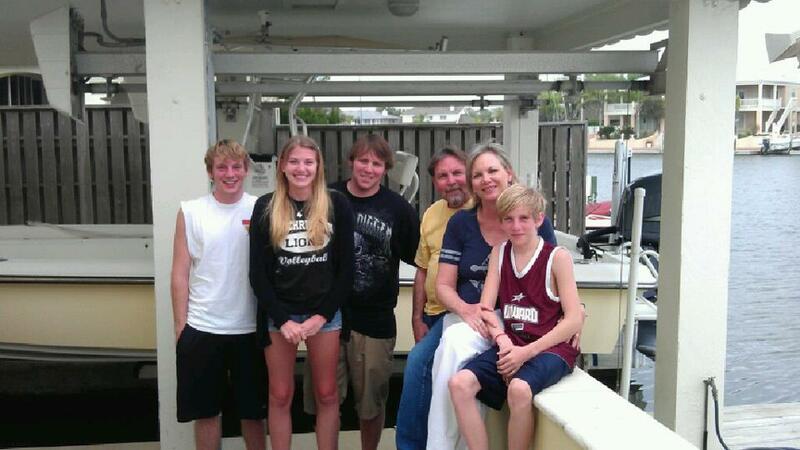 At the beginning of 2012, John was diagnosed with brain cancer. After 6 months of living out his wonderful life on earth with dignity, he passed away on July 2, 2012. Before writing this post, I met and had lunch with Darleen Park to talk about their life together. She was very kind to reflect on so many personal details that were still raw in her memories. She is an amazing woman full of strength and courage. Darleen and I met at the French Sandwich Cafe, a local hole in the wall dive, where John and Darleen would regularly frequent for lunch dates. It is a great place. The restaurant serves french food and is owned by a wonderful Asian family that has been in business for many years. 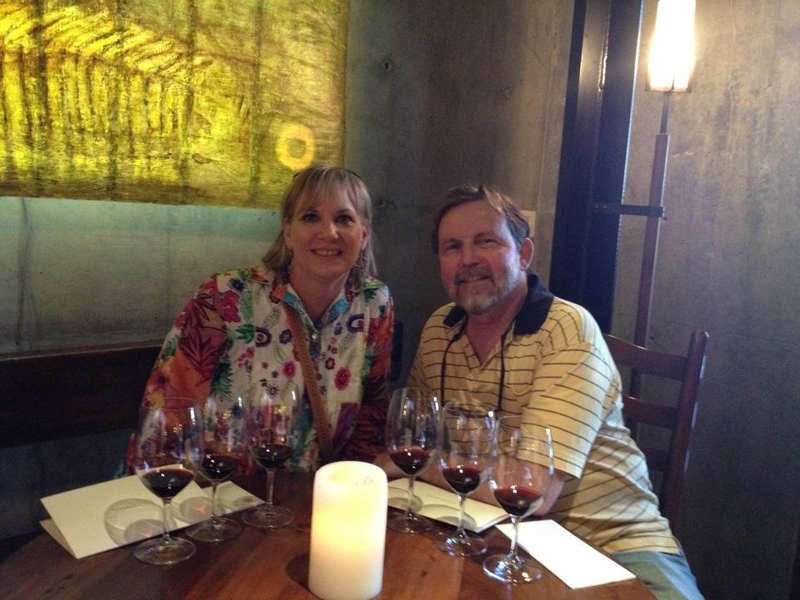 “It is one of those lucky finds,” Darleen said about the place, “John and I Ioved meeting here for lunch.” The day we met was also Valentines Day and the day after their 26th anniversary of their first date at the San Antonio Rodeo. It all seemed fitting despite the tenderness of the moment. It will be a Valentines Day I will always cherish. In the mid 1980’s, John found himself dating again…and boy did John date around! He once told me that me must have had 50 dates with great Christian women (many from TBC…another act of grace by his head pastor! ), but they never seemed to last much past the first date. John once said smiling to me that “his reluctance to never go on date #2 made many of the girls pursue him even more.” He was a true but genuine ladies man. Even in the dating life…God seemed to have his hand in John’s life. Darleen Prewitt was new to San Antonio. She came to Texas from Oklahoma to attend The University of Texas in Austin. After graduation, she began graduate work at UT Health Science Center to become a nurse. Daughter of a military chaplain, she wanted to find a good church home and found that home at Trinity Baptist. This “Oklahoma Longhorn” quickly became involved with the young adults ministry and joined the Women’s Volleyball Team at TBC…quickly becoming the captain. One day she received a call from John…assuming “he was letting her know of a change in the volleyball schedule”…but instead, he was asking her out on a date to the San Antonio Rodeo. It was a slick move by the TBC ladies man. Being a good ole country girl, she accepted the offer! That week they went to see Michael Martin Murphy (who surprisingly looks a lot like JP. ), and they attended the livestock show in the Freeman Center. After the lovely date, John quickly knew he wanted to take this beyond his usual first date, and he began to seriously pursue Darleen. Four months later they were married on June 20, 1987. “We even had to wait longer to get married because of other family wedding commitments that were planned for over a year…we were ready and eager to hitch up and get married,” Darleen said. It was true love…like a “wildfire” according to M.M. Murphey. Once married, John and Darleen loved spending time at John’s family ranch in Blanco, TX. Both Darleen and John were country folks through and through. Darleen told me over lunch, “We did not have a cabin there. So John, being such a resourceful man, turned a small goat house into our bedroom by lifting the roof and using sliding doors as the window and door. One night while sleeping, we noticed the family horse standing over our bed, I guess the horse did not get the memo about the change! That is the kind of life we lived…simple, fun, and laid back. We loved spending that kind of time together. The time we spent at the family ranch was one of the happiest moments of our lives.” I understand John’s love for his ranch. My family’s ranch means more to me than even my hometown. It’s a place of retreat, nature, and family memories. It’s amazing that an old goats barn and a small amount of land can be so holy….but somehow it becomes just that…holy ground. The family kept growing. In 1991, John and Darleen gave birth to their son Dakota Richard. Soon after, in 1992, they had their daughter Amber Kay. They began being involved more and more as parents at TBC…helping with sports teams and children events… but they were ready for one more child. In the year 2000, they had another child, Sawyer Dillon. It has been a joy serving their children at Trinity Baptist. Dakota was a graduating senior when I arrived here in the summer of 2010. 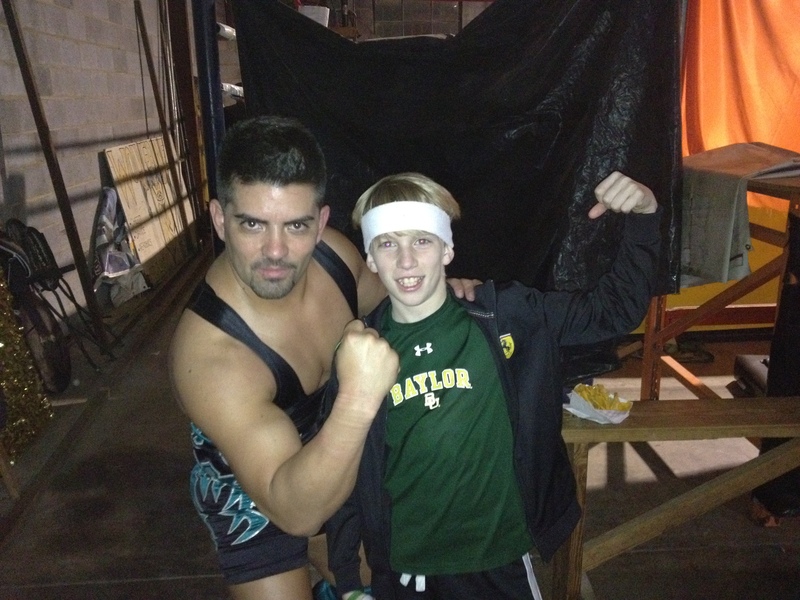 He now attends Baylor (like his dad) and is a member of the Baylor Wake Boarding Team. Amber attended camp with us one more year and now is attending college in San Antonio. Sawyer is currently a sixth grader and participates in Upward Basketball. He’s a solid player. (Even though my team beat his team three weeks ago! Hey, a man has to brag!) However, I am afraid he will beat my team next time. He has gotten better! 🙂 My favorite memory with Sawyer was taking him to a vintage Luche Libre Mexican Wrestling match in South San Antonio. It was like the Jack Black movie, Nacho Libre. We had a blast watching those amateur wrestlers fake hit each other. We both like the crazy and random experiences in life. So…we get along well to say the least. As a pastor during the 90’s, 00’s, and 10’s, John witnessed Trinity Baptist Church go from about 6,000 members to about 1000 members on an average Sunday. The changes at Trinity were dramatic to put things lightly. After the retirement of head pastor,Buckner Fanning, and the relocation of many San Antonio residents to the North Side, the church went through some very hard years full of quarrels and fighting. Many of the pastoral staff and laity were leaving the church over bitter reasoning and misunderstanding about others at TBC. Some of the issues were natural changes that happen in the life of a church, some were political, some gossip, and some a mixture of all three. But John…he remained true to his calling, his church, and his family. He was the consistent presence for many who remained attached at Trinity. “Apart from his gift of pastoral care, (one he had developed was hospital visitation…visit after visit), consistency is what made him such a powerful presence at Trinity,” Darleen told me with assurance. It just proves to me that even without the pulpit, the microphone, or head pastor title…an associate minister can be just as effective and influential as the preacher. Despite all the political battles for power and people’s desire to find a source of blame in every problem at Trinity, John never allowed himself to be “labeled or defined a certain way by others around him” Darleen said. “I think that is what kept him sane and level headed all through those years.” I was told once not to be worried how people define you, because when they do, they limit themselves…so it’s their problem. I think John would agree with that statement. Trinity is now becoming peaceful again. One of my favorite memories of John was when we invited Buckner Fanning back to TBC to speak to our students during Sunday School. It was a precious moment of remembrance, love, and God’s grace. A Sunday morning and learning experience this young pastor will never forget. When we live in grace and understanding…we all have the ability to come back to life. Both individually and communally. Apart from his family and personal faith, John found solace and peace when he needed a break from life’s “busyness” through his love for country music. For years John would dabble in his own music and play for his church, friends, and family. 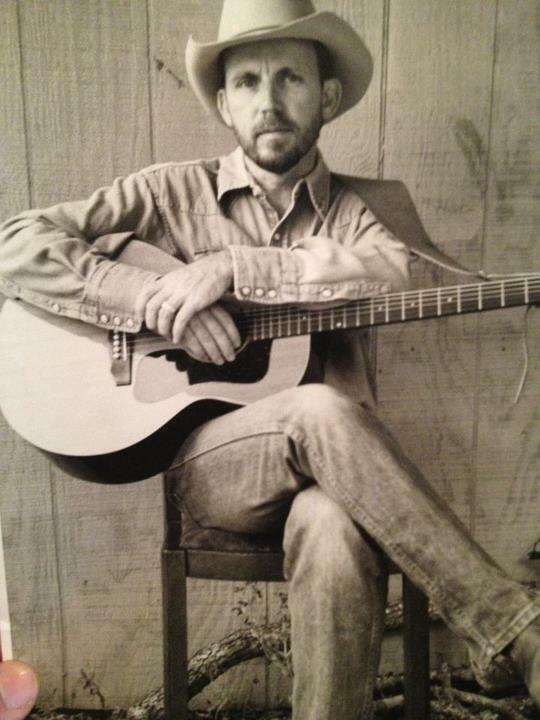 He loved the music of Willie Nelson and Johnny Bush (who was a member at TBC and writer of the song “Whiskey River“). John played many of the old country classics and gospel songs he grew up listening to on the radio or in church. In 1999, he hooked up with good friends Dean, Steve, and Glen and formed the “Crooked Toe Band.” They quickly became a hit around San Antonio! They would play around at local taverns, restaurants, and events…not to mention TBC’s Rodeo Sunday, year after year. I will never forget the last time John and his band sang “This Little Light of Mine” at Trinity’s Rodeo Sunday in 2012. The song was a healing moment for all who attended. 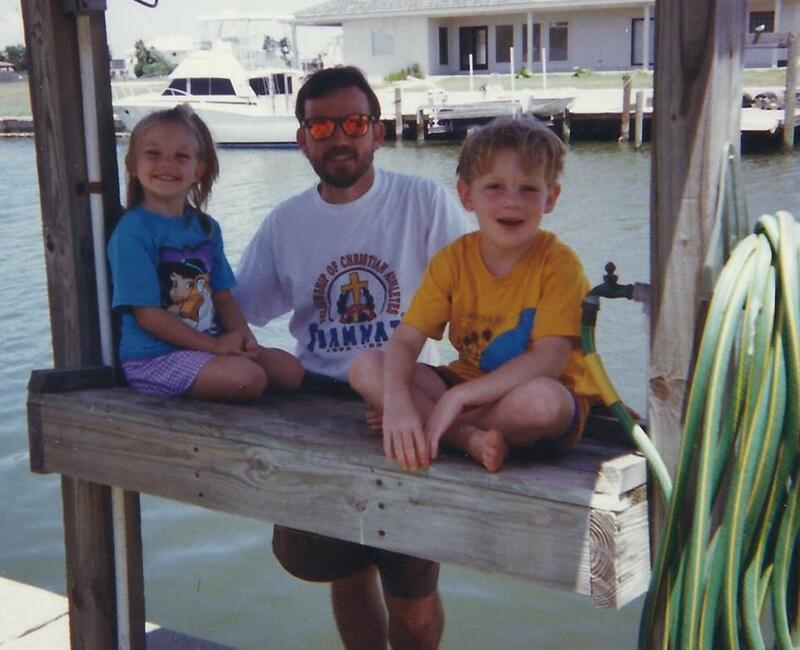 In 2008, John was diagnosed with skin cancer. It was a nerve racking time for both Darleen, himself, and the family…but they pushed though the treatment and came out okay. During that time they learned to grow both as a couple and a family. “At the time we were so focused on our careers and work that we often would neglect to find time in the present…like many of us commonly do. The irony is that both of us knew better because of our professions. I had been a Hospice Care provider for years, and we both knew about the reality of death and the fragile nature of human life,” Darleen reflected. John and Darleen had a common game plan before the cancer scare: Work hard at their jobs, serve people, take care of business, and plan to live to retirement where they can then spend quality time together. Many of us have the same life plan. “It’s human nature,” Darleen reminded me, “but cancer changed that in both John and me.” (Darleen battled with a cancer earlier in the decade and dealt with many of the same feelings…but her form was easily treated.) During this journey, they both became more dedicated to seize the day and every family opportunity. However, the reality of death seemed still so far away. In 2012, like many who face cancer, John’s cancer returned quickly and aggressively…which shocked both his family, his church, and himself. She, the doctors, and John both learned that the cancer was very aggressive and would most likely take John’s life within the year. “Being a hospice nurse and having the knowledge of a hospice care provider is both a blessing and a curse,” Darleen admitted. “I believe in God’s healing power [both through divine means and medical measures], but the nature of healing is not a special equation. God is the ultimate authority of our lives.” In his last months on this Earth, John lived out his life with dignity, peace, and the understanding of God’s will. “I have never witnesses anything like it,” Darleen said, “John had total assurance in God’s plan and was determined to make good memories until the end.” Ed Nelson, TBC’s Church Administrator, once told our pastoral staff about John’s willingness to make memories during his sickness. 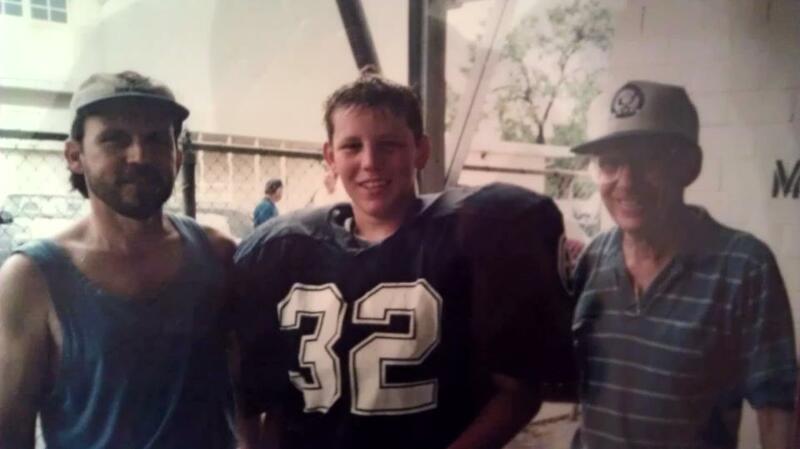 Ed recommended to him that “making memories that last” was the most important thing to do when faced with such daunting news and the reality of death. I love that advice. Darleen said the same thing at our lunch together. 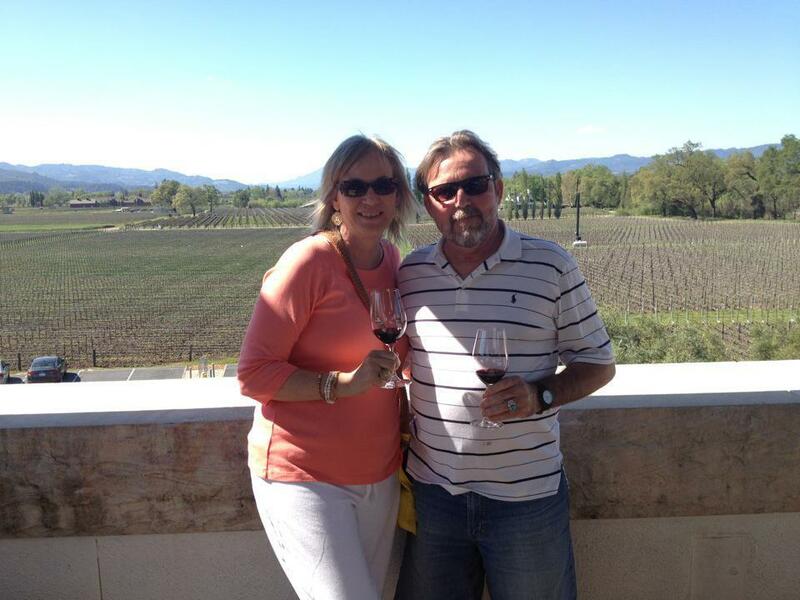 Despite the battle cancer was having on John’s body, they made great memories by going to the Gulf Coast as a family and having a romantic couples retreat in the wine country of California. His kids were wonderful and truly cared for there father during the last few months. Even in the small ways…like when Amber would take beauty naps with John during the afternoon when he grew tired…or when JPIII would carry the family dog into the bedroom to play with John. “Those last days will stay with me [and my family] forever” Darleen said. Lasting memories do not have to be grand. They can be found in the smallest acts of love. John always desired to be last. He lived his life in the Great Reversal…Not to gain any reward, but to claim God’s presence in his life with love and consistency. Since John’s passing, Darleen is committed to living the same way in her work with Hospice and with her family. All she aims to do now is to honor her God and her husbands life by doing all she can to love those around her. Some days are good and some days are bad…and often confesses that she “cannot figure out how to take the next breath” without her love. But Darleen reminded me that True Love is eternal and not temporary. When we have faith in Christ, our loves and friendships don’t remain here on earth but find hope in eternal life. Darleen, who had to endure the life of a pastor during church corruption and collapse, is also one of my church heroes. Her life as a Hospice care provider has been just as ministerial as any clergy on paid staff (probably even more so!). With her clients, she offers tender care full of peace, love, and honesty. She treated John the same way…regardless of the doctors instructions “not to be his nurse.” But “of course I did sometimes…he needed me.” With her church she offers the example of a living sacrifice. She, like John, never attempted to lash back at members in the congregation that caused their family so much pain. “Trust me, there are days I wanted too! But I knew John’s heart and love for his church and understood the real reason he stayed, even when he could have easily left for a less stressful position.” Through her trails and journey with cancer, Darleen has taught me that love for your family, even church family, has to be patient in suffering because you only go through life once. It will get better. John’s ministry and care for his church will remain with me forever. We were once at a Pastoral planning retreat and stuck in meetings that lasted all day. It was terribly boring and cumbersome. I was restless and needed to take a break from the circular conversations pastors have while gathered in the same room. During a break before we left the camp, John and I decided to go cliff jumping at one of his favorite camp swimming holes at Laity Lodge. When we climbed the large cliff to jump into the water, I became nervous and froze. It took me a while to jump…to teach myself that I was nervous about nothing…John leaped off the cliff and fell into the Blue Hole. After he rose safely, he said…”you just have to jump!” So I did. And loved the fall into the water. Sometimes despite our fears, we have to jump and take a leap of faith. John was never afraid to make those leaps of faith. Even in his last days. Two days before John passed away, he was miraculously able to get up and move around after many days of being asleep or unconscious. Despite the difficulty of movement and speech, John seemed determined to take a trip around town with his family. It was a leap of faith. They asked him where he wanted to go and decided to drive by Trinity Baptist and get milk shakes. Once they got their drinks, John became aware of the moment…looked back at his family in his car and said “Cheers!” while lifting up his drink. Goodbye was not an option for John. Therefore…I will end with a Cheers. Cheers for a life well lived. John, I leave people with this song. And to be honest. Do many of these things really keep us from experiencing God? If not…what truly keeps us from God that we should really give up? Lent is more than just about a fast. Lent is a time for our own reflection. But more importantly. Lent is a time to focus on humanity. Just how Christ focused his love toward us when choosing to return back to Jerusalem and make things right. 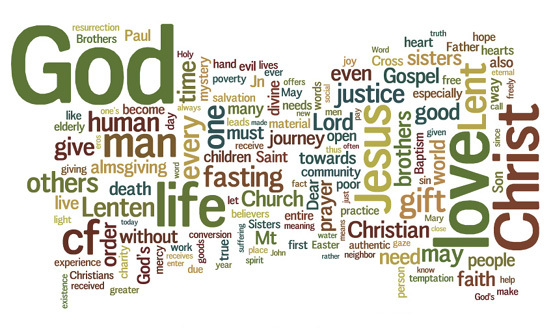 Below is a Word Cloud taken from Pope John Paul II & Pope Benedict’s lenten homilies the last ten years. 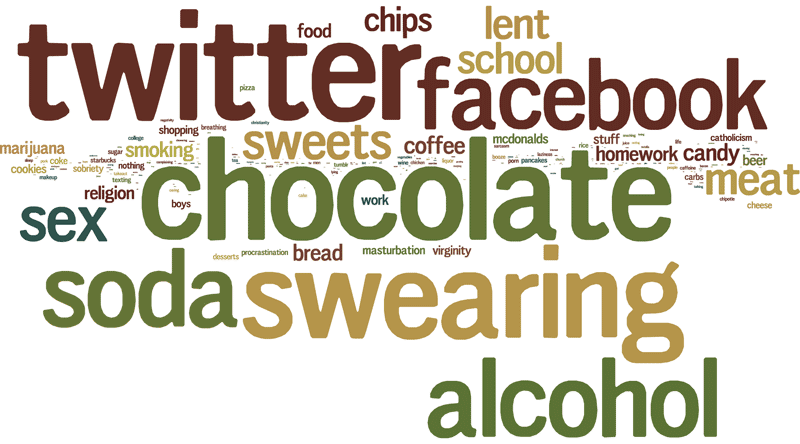 What are the real themes of Lent according to the Holy See? humility, patience and love to Thy servant.